The Field Contamination Study (FCS) was designed to determine the field processes that tend to result in clean field blanks and to identify potential sources of contamination to blanks collected in the field from selected volatile organic compounds (VOCs) and wastewater-indicator compounds (WICs). The VOCs and WICs analyzed in the FCS were detected in blanks collected by the U.S. Geological Survey (USGS) National Water-Quality Assessment (NAWQA) Program during 1996–2008 and 2002–08, respectively. 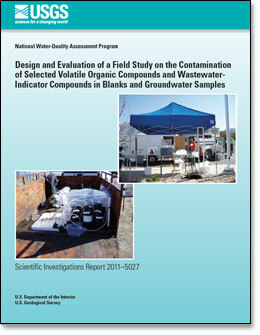 To minimize the number of variables, the study required ordering of supplies just before sampling, storage of supplies and equipment in clean areas, and use of adequate amounts of purge-and-trap volatile-grade methanol and volatile pesticide-grade blank water (VPBW) to clean sampling equipment and to collect field blanks. Blanks and groundwater samples were collected during 2008–09 at 16 sites, which were a mix of water-supply and monitoring wells, located in 9 States. Five different sample types were collected for the FCS at each site: (1) a source-solution blank collected at the USGS National Water Quality Laboratory (NWQL) using laboratory-purged VPBW, (2) source-solution blanks collected in the field using laboratory-purged VPBW, (3) source-solution blanks collected in the field using field-purged VPBW, (4) a field blank collected using field-purged VPBW, and (5) a groundwater sample collected from a well. The source-solution blank and field-blank analyses were used to identify, quantify, and document extrinsic contamination and to help determine the sources and causes of data-quality problems that can affect groundwater samples. Concentrations of compounds detected in FCS analyses were quantified and results were stored in the USGS National Water Information System database after meeting rigorous identification and quantification criteria. The study also utilized information provided by laboratory analysts about evidence indicating the presence of selected compounds, using less rigorous identification criteria than is required for reporting data to the National Water Information System database. For the FCS, these data are considered adequate to indicate "evidence of presence," and were used only for diagnostic purposes. Evidence of VOCs and WICs at low concentrations near or less than the long-term method detection level can indicate a contamination problem that could affect future datasets if method detection levels were ever to be lowered. None of the 13 VOCs and 16 WICs included in this study were quantified in the VPBW collected and analyzed at the NWQL. This finding indicates that the VPBW was "contaminant free" when it was shipped from the laboratory to each of the field offices, although some compounds were present in some of the samples at concentrations less than minimum detection levels based on evidence-of-presence data. Toluene, m- and p-xylene, benzene, and carbon disulfide were each quantified in an FCS field-blank analysis, but not in the associated groundwater sample. The native-water rinse of the sampling equipment conducted just before collection of the groundwater sample likely reduced low-level contamination with respect to these compounds. VOCs had lower detection frequencies in source-solution blanks and field blanks collected during the FCS than in the historical dataset collected by the NAWQA Program during 1996–2008. The detection frequency of toluene in field blanks was reduced about an order of magnitude from about 38 percent in the historical NAWQA dataset to 3.1 percent in the FCS dataset. Other VOCs quantified in 5 percent or more of the field blanks in the NAWQA dataset, but not quantified in the FCS field-blank analyses, were ethylbenzene, o-xylene, styrene, 1,2,4-trimethylbenzene, chloroform, dichloromethane, acetone, 2-butanone, and tetrahydrofuran. The lower detection frequencies of most VOCs for the FCS, compared to historical NAWQA data, can most likely be attributed to the use of fresh supplies and rigorous adherence to the protocols for cleaning equipment and collecting samples. Chloroform, a disinfection by-product that is commonly present in tap water used to clean sampling equipment, was not quantified and had no evidence of presence in the FCS field-blank analyses. It is probable that the relatively high detection frequency of chloroform in historical NAWQA field blanks (about 20 percent) is the result of inadequate rinsing with sufficient volumes of VPBW following cleaning. The WIC phenol had a high detection frequency in source-solution and field blanks (70 and 64 percent, respectively) collected by the NAWQA Program during 2002–08, compared to a detection frequency of about 3 percent in the FCS source-solution and field blanks. The detection frequency of benzophenone and N,N-diethyl-meta-toluamide (DEET) in field blanks also was substantially less in the FCS dataset (no detections) compared to historical NAWQA data (about 29 and 36 percent, respectively). Evidence of presence of benzophenone, caffeine, camphor, DEET, and methyl salicylate in FCS source-solution blanks, field-purged source-solution blanks, and field blanks could be attributed to products containing these compounds being used by sampling personnel. The lower detection frequencies of selected compounds in the FCS field blanks, compared to historical NAWQA data, indicate that careful attention to field protocols will result in higher-quality field blanks. Extrinsic contamination introduced to source-solution blanks and field blanks can make it more difficult to understand the quality of groundwater-sample data and can cause detections of compounds to be questioned. Following the prescribed field procedures will minimize the potential for introduction of VOCs and WICs to blanks and groundwater samples. Thiros, S.A., Bender, D.A., Mueller, D.K., Rose, D.L., Olsen, L.D., Martin, J.D., Bernard, B., and Zogorski J.S., 2011, Design and evaluation of a field study on the contamination of selected volatile organic compounds and wastewater-indicator compounds in blanks and groundwater samples: U.S. Geological Survey Scientific Investigations Report 2011–5027, 85 p.